Thank You 2015 Rooo Rally Supporters! Bark Busters Dog Training & Behavior Specialist, Linda Brocke. Linda will host several thirty minutes group sessions during the Rally and be available throughout Friday and Saturday on the lawn by the pool to help with individual issues! Bio: Greyhounds are special dogs! I fell in love with their faces on the adoption links of racing websites and adopted a beautiful female who lived to be 14 years old. I grew up with boxers and have always had a dog in my life. Five years ago I became a Dog Behavior Therapist and Trainer with Bark Busters Home Dog Training using natural techniques to communicate with dogs. I am always amazed by the affinity between dogs and their owners. I can address issues like separation anxiety, reaction on leash, fears, housebreaking. Understanding canine behavior and the special needs of Greyhounds makes for true companionship and enjoyment of the breed. Whenever I meet a Greybaby I need to love on them. Happy Hound Designs by Lynne Piper with one of a kind Martingale Collars, leashes, poo bags, bandannas and much more. Marlene Iredalle with handcrafted Woodwork lanyards keychains, toys, and much more. combined with Reiki. Canine Massage is a holistic complement to traditional veterinarian care. Dr. Lewis furthered his education by attending the Chi Institute and became Pensacola's only certified veterinary acupuncturist. He can offer a unique blend of traditional and alternative veterinary medicine. Visit him at the Rally! 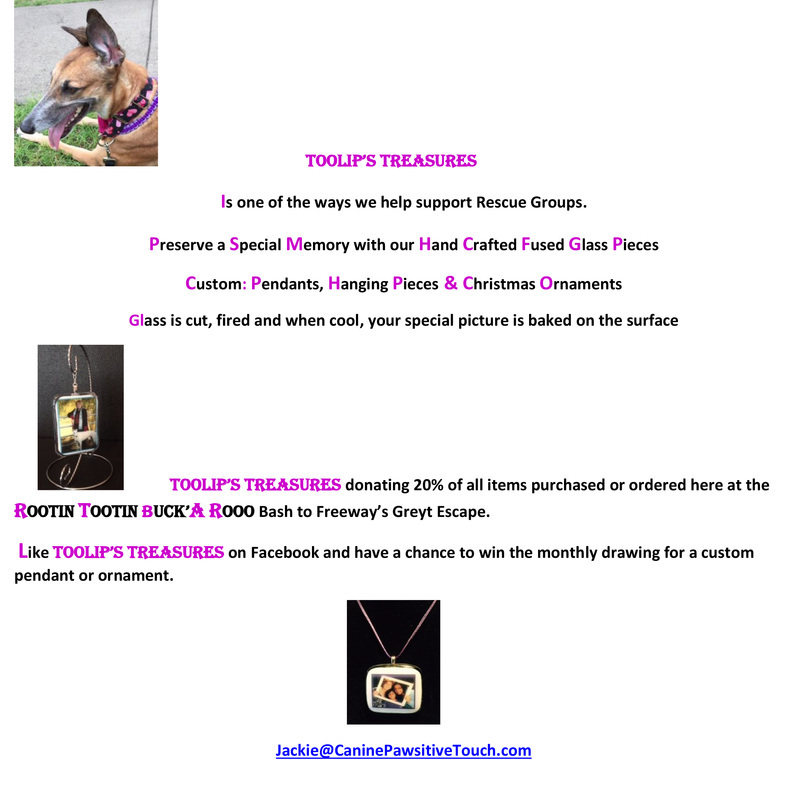 Selling specialty greyhound items and Freeway's Rooo Rally Event Shirts! Villa Pupzelle makes all-natural, all-organic dog cookies. Modeled after the Italian waffle cookie, the Pizzelle, our cookies are just as delicious but made specially for your furry friends. All cookies are made with brown rice flour, egg, a touch of honey and the flavor of choice. Current flavors are peanut butter, apple, banana, and pumpkin. From greyhounds to dachshunds and all breeds in between, our cookies will be sure to please your pup! Cadillac Quality VendingCadillac Quality Vending is the largest vendor in southwest Florida and this was not achieved by accident. We are a Canteen franchise, the largest vendor in the United States and part of the Compass Group. Although we are a Canteen franchise we are a local, independently owned company and are supportive of the local communities where we do business. As a Canteen franchise, we are able to offer exclusive quality products (see product list). Canteen sets the bar pretty high for its franchises and SERVICE is number one. The truth is, our beverages and chips taste like our competitors, but our service and equipment is second to none. Our Full Service Vending includes state-of-the-art equipment, premium name brand food, snacks, soda, water, specialty drinks, coffee machines, cold and hot food machines, office coffee, award winning cafeteria design & layout and food service management.